Many years ago, there was a meeting at the Edgewater Beach Hotel in Chicago. In attendance were some of the most powerful men in the world at the time. They included the president of the New York Stock Exchange, the head of the world’s largest monopoly, the president of the Bank of International Settlements, and five other presidents of companies that dominated their respective industries. One of those men went insane. Two ended up financially ruined. Three committed suicide. Two spent some time in prison. Now these eight men were not the only people at the meeting. In fact, there were several presidents there who enjoyed long lives filled with good health and happiness. Even though their positions and background were similar to those of the eight presidents already mentioned, their lives ended very differently. Have you ever wondered, as I have, what makes this kind of difference in people's lives? It isn't talent or intelligence or dedication. These men all rose to the top, yet some died miserable while others died fulfilled. "The answer may surprise you," Zig Ziglar said. "It takes money to buy a big house, luxury cars, and luxury vacations. But there is one thing money can't buy that those eight men never had. As a result, they lost everything. The other men who died fulfilled it, they had it. And now I'm going to tell you how to get it." They used to say the American Dream was to own your own home. Well, perhaps that used to be the American Dream, but today it's a lot more than that. Today the American Dream is to have it all - financial prosperity and security, peace of mind, health, happiness, good friendships and family relationships, and the hope that the future is going to be better. But the problem is, many people put financial prosperity at the top of the list, and they make sacrifices based on that priority. Even if they say money is not important, their actions prove otherwise. As a result, their life falls short of the one they hoped for. Don't get me wrong - financial prosperity is a wonderful thing. But there's something much more valuable that I'll tell you about in a minute. When you have it, not only can you achieve a greater amount of financial prosperity and security than you could have otherwise - you can have it all - the modern-day American Dream. How do you get beyond the "money is top priority" mindset and enjoy greater financial prosperity and fulfillment as a result? A young man named Steve Walker walked into my office several years ago. A friend of his had flown him down from Toronto because he wanted Steve to see me. He thought Steve needed a change. Turns out Steve left for work at six in the morning, and he got home every night between ten and eleven. That was six days a week. On Sundays he was so exhausted he slept all day. He had no family life. He was so tired he had run off the road two or three times driving back and forth the 20 or 30 miles he had to go to his job. His wife was threatening to divorce him. Everything in this guy's life was falling apart - the whole nine yards. Steve's friend had forewarned me of all this, and when I met with Steve, I discovered his boss was the person he looked up to the most. "Most successful man I've ever seen." I said, "Okay, let's look at your boss. Here's what I want you to do. I want you to give your boss a plus or a minus grade on all the questions I'm going to ask you." I asked, "Steve, how happy is your boss?" He thought a minute. "I never really thought about it until now, but I don't think he's happy at all." "Well, we'll give him a minus on that, right?" "Why do you say you don't think he's happy?" "Well, uh, number one, I've never heard him laugh. He seldom smiles, and besides that he has ulcers." "Well, let's see now, that tells me something about his health. Do we give him a plus or minus on that?" "Oh, that looks like a minus." And I said, "If he's got ulcers, that tells me something about his peace of mind. Do we give him a plus or a minus?" "Okay," I said. "How prosperous is your boss?" He said, "Man, he's got money running out of his ears. That's why he's my role model." "I guess we give him a big old plus on that one." I said, "How secure is he?" "Well, he's as secure as money can make you." "We had some billionaire brothers here in Dallas who went bankrupt. How does your boss compare?" "He doesn't have that kind of money." "We had an industrialist here who was worth half a billion. Does he have that kind of money?" "We had another one, a former governor worth a hundred million at one time. He's bankrupt. How does your boss compare?" Steve said, "Oh, man, he doesn't have that kind of money." "Well, I don't want to give him a plus, I don't want to give him a minus. What about a question mark? Would that be fair?" "I never thought I would say this," he said, "but that would be more than fair." "How many friends does your boss have?" Steve pondered for a moment. "Really, I don't think he has any. I'm not his friend; I just admire him because he's so successful. To tell you the truth, the guy's somewhat of a jerk." "Well, we're sure going to give him a minus on that, aren't we?" He sighed, "Once again, yes." I said, "Tell me about his family." "Well, his wife's divorcing him." "Then we have to give him a minus for that." "Yes we do. I can't believe it! He's getting a minus on everything." "How much hope does he have for the future?" "Well, before I started talking to you, I thought he had lots. But now I don't think he has any real hope." "Well," I said, "another minus." "Steve, let me ask you a question. Of the eight things everybody wants, your boss gets a minus on six, a plus on one, and a question mark on one. Knowing what you know, would you swap places with him?" I ask you, dear reader, would you swap places with Steve's boss? Regardless of how much money you don't have. Regardless of where you are on the totem pole. The answer would emphatically be "no" wouldn't it? Steve's answer was also "no." I said, "What your boss is missing, Steve, is the one thing money can't buy. If he had this one thing, he would be able to turn every minus to a plus." "What is it?" Steve asked. "I'll show you what it is, and I'll show you how to get it," I said, and I spent the next several minutes explaining it to him. Three or four years later, I was speaking in Baltimore, Maryland. A young man came up to me and said, "Do you remember me?" And even though I have a brilliant memory, it's awfully short. He said, "Well, I'm going to tell you one thing, and then you'll remember. I'm the young man from Toronto who sat in your office." I said, "You're Steve Walker." He said, "You bet. Look, I want to show you some real growth. I took your advice and I dumped my job and my 80-hour workweek. I now have a better job with far fewer hours and much better pay. I was able to go back and court my wife and spend time with my family again. And now we have a new member of the family - take a look! That secret you told me worked." Let me tell you, stories like that are why I do what I do. I'm not in the speaking business. I'm not in the training business. I'm not in the book and recording business. I'm in the life-changing business. Now why was Steve able to do so much more? It's the secret I told him - a secret you'll learn in my audio program, entitled A View from the Top. In a nutshell, A View from the Top is about synergy - that state of the affairs in which every part of your life interlocks seamlessly with every other part, with the net effect of enhancing your experience and boosting your performance higher than it's ever been before. When you work on the secret that I told Steve and that I tell everyone who comes to see me, you develop a perfect balance. The reality is that your personal life affects your family life, which affects your business life, which affects you physically, which affects you financially, which affects you emotionally. Everything in your life affects everything else. When you know how to get the good things that money can't buy and you use my secret for established synergy in your life, you will actually find yourself making more money. Have more freedom to do the things in life that really matter to you. Find that your relationships with friends, family, and associates improve and you will experience more love in your life. Have more peace of mind, which will enhance your health and make you happier and more content. And all these things together will create a strong feeling of optimism about the future. Everything in your life affects everything else. Synergy will let you do everything better. It will allow you to use your knowledge, ability, training, and experience in new, more productive ways. Suddenly, you'll find yourself more competent at what you're doing. Your confidence will climb. You'll be more a team player and an encourager, and you'll have a certain charisma that draws people to you. You'll move faster - with more purpose - but you will also inspire the people around you to increase their output as well. And that will help the entire company's financial position and profits. It doesn't matter where you start; it's where you go that's important. You were born to win, regardless of where you were born. But in order to be the winner, you've got to plan to win and prepare to win. Only then can you legitimately expect to win. A View from the Top will give you the planning and preparation you need to reach your modern-day American Dream. It will show you how to capitalize on your dreams and your imagination, your commitment and your courage, and apply them all to the benefit of others. You'll get everything you want because you'll be helping others get what they want. And your view from the top is going to get better all the time. Learn these ideas because when you do, I will definitely be able to tell you, "Welcome to the top, the view is magnificent. And look at all the people you brought with you!" That's what makes it so beautiful. Do that and you will look back on your life and say, "I've had a richer, better, more fulfilled life." That's what's important. I want to have the 8 things everyone wants in life. 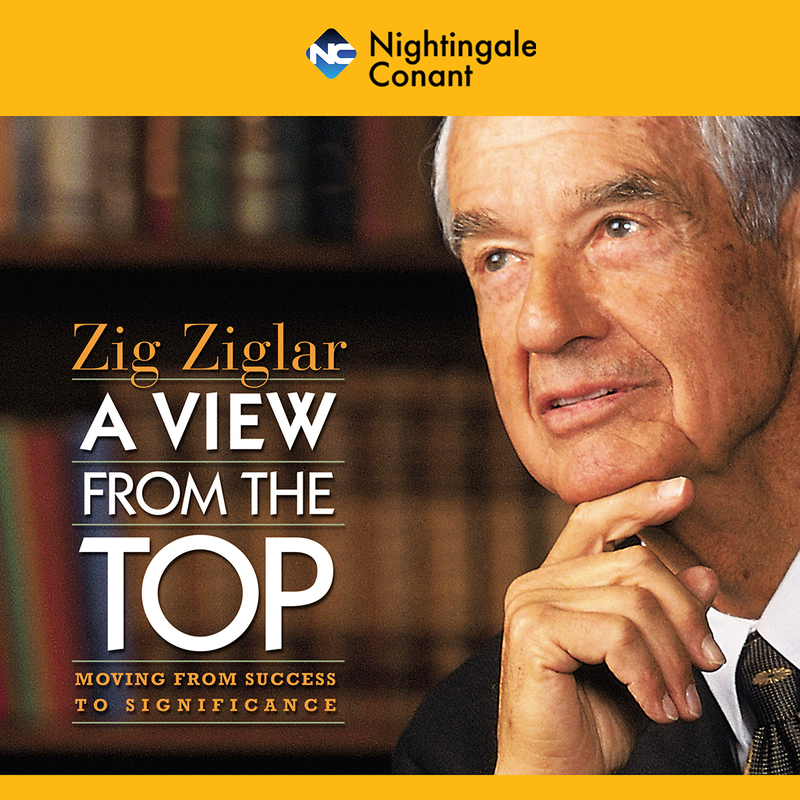 Please send me Zig Ziglar's audio program A View from the TOP, at the special price below. - I can select one of two ways of ordering.